Sports team schedules are printed over large space and they are always in demand. Professional teams and local teams can easily resort to 4×7 sports schedule magnets popularizing their game schedules. They can gift away personalized magnets during tradeshows, sports events, school events and on many other occasions. People would be happier to receive large and sports-friendly personalized magnet, which helps them track schedules of their favorite team. No doubt, they would retain it over their work cabinets or refrigerator doors. Business flyers are popular marketing items and they are used by all types of businesses to promote their services and products. People usually trash flyers because they are printed on the lightweight and cheaper paper. Many marketers are resorting to colorful and glossy brochures to avoid trashing. What if they can find a product, which combines purpose of a paper flyer and a brochure? Their requirement would end up at 7×4 magnets. Perfect for tradeshow gifting and business gifting throughout the year because people love large full color magnets. Until some years back the word save the date was synonymous with pre-wedding invitations, however the times have changed. 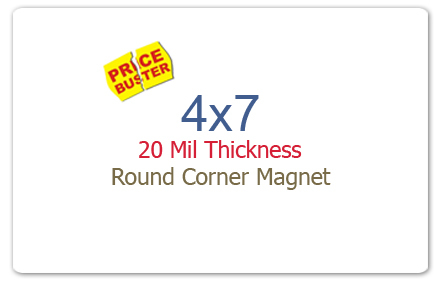 Today, small and mid-sized businesses are seeking 7×4 magnets for announcing their business milestones or corporate events. Save the date magnets are also employed for announcing the opening of a new store or shifting of a business to the new location or announcing annual corporate event, etc. If not anything else, at least businesses can stay assured that full color magnets would end up becoming good refrigerator art. When someone attempts at awareness generation, they definitely know the huge responsibility that rests on their shoulders. This is why many responsible social evangelists are resorting to 7×4 magnets for making their point. They know people cannot easily ignore them even if they work through large promotional items. Many social organizations and individuals are using 7×4 magnets for info building.They know people would happily retain them over their refrigerator doors. Info magnets/awareness magnets are also perfect for corporate companies and small businesses, which wish to highlight their commitment towards social responsibility. They can offer these customized magnets as fundraiser token or an appreciation for supporting a cause. Whatever be the reason for employment, people are going to love these custom magnets. Calendar magnets are one of the most popular promotional items on the scene. They have become a symbol of smart advertising because they end up grabbing a large face time over the refrigerator door. There is no one on the earth, who might not have used a calendar at least once during their lifetime. Therefore, by gifting a large sized 4×7 calendar magnet you are targeting vast demographics because people of all age groups refer the calendar. They would lovingly retain it as a reference over their refrigerator doors or as a refrigerator art. On sourcing your 4×7 magnets from a reputed online store stocking personalized magnets, you can receive free online design proof, free art setup, and free shipping.